A most attractive and robust Chalet designed to meet the widest possible range of needs, be it a Home Office, Workshop, Leisure Room or Hobby Home. They are designed to give a pleasing appearance to blend with your home and garden. 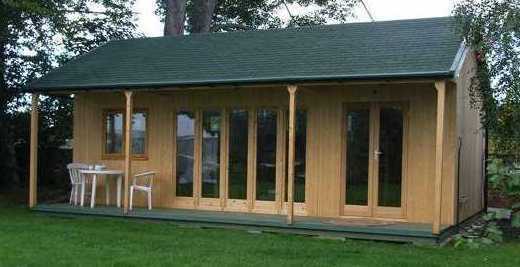 Chalets can be manufactured to your own size and design. This building is nornally supplied with a timber floor. Alternative doors and windows can be quoted, internal walls and roof can be lined and insulated. Please contact our Office for further details or to request a free colour brochure and price list for your perusal. Prices start from 3.74m x 3.6m (12' x 12') including a 1.2m (4') verandah with three opening Jeld-wen windows 1195mm x 895mm high (4' x 3' high) and one single magnet half glazed door. Delivered and erected on your prepared base. £3134.00 plus Vat. Other sizes can be quoted on request.